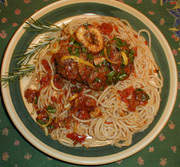 Osso Bucco or veal shanks is an easy but unusual dish that is imbued with the flavors of Provence. This dish takes very little preparation but does take some time simmering until the fresh tomatoes and the meat have joined each other in harmony. The presentation is dramatic and simple to pull off. Served over a bed of pasta, garnished with fresh basil, acompanied by a crunchy french loaf and a rich hearty wine it makes a meal that gratifies all the senses.